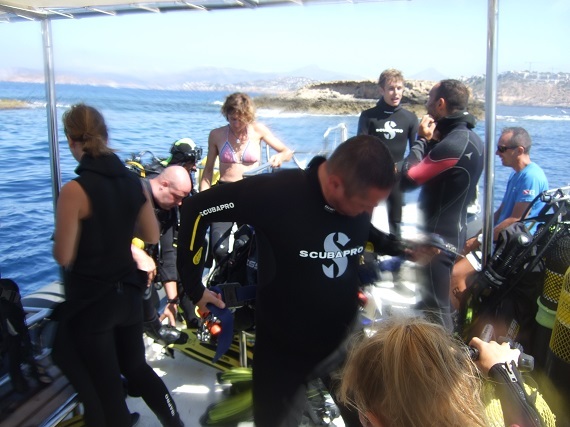 I signed up to dive in Mallorca, aware that Great White Sharks have been spotted the popular Spanish island this year. Would one show itself for us? 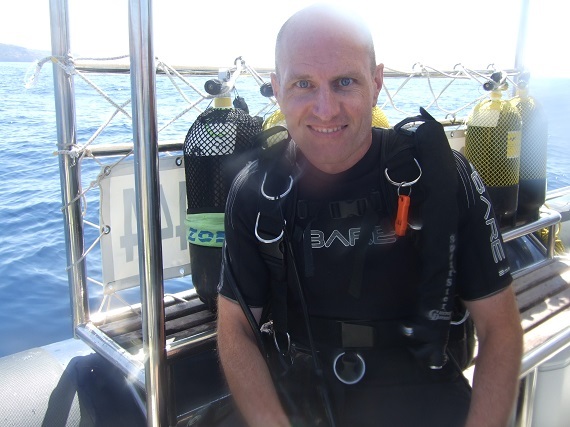 Protection from sharks doesn’t feature heavily on my list of must-haves, wherever I’m diving. But this year I felt particularly vulnerable to the elements – I pulled on my shorty wetsuit while everyone else donned full-length steamers, boots and hoods. After one of the harshest winters here in the UK that I can remember, perhaps I’ve become battle-hardened to cold water – or so I thought. In my defence, Mallorca (topside) during my visit this year welcomed us with unbroken sunshine and temperatures in the mid-30s. 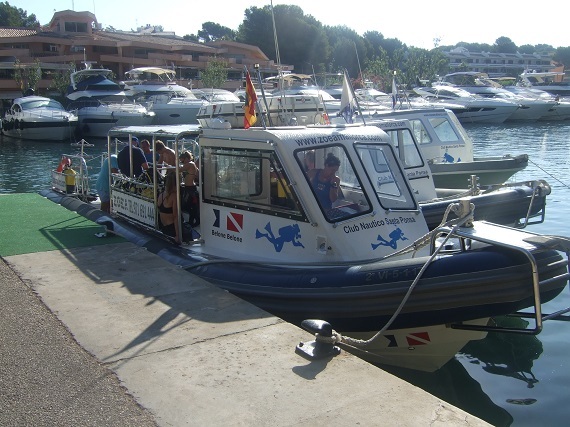 After three days of this, my subsea excursion with ZOEA Mallorca promised to offer some relief from the blistering heat. 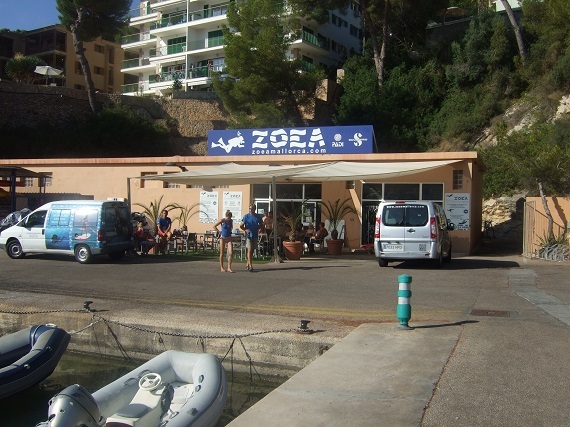 ZOEA is a busy and well-run outfit: I was picked up promptly from my hotel and whisked to the other side of Santa Ponsa. The dive centre is located in a very upmarket gated marina, with luxury yachts moored all the way along a crowded waterfront. It was a hive of activity when we arrived, and the friendly staff checked me in quickly, before assigning me a place on one of their three super-sized RHIBs. So in just that shorty and closed-heel fins I splashed in to the crystal blue seas. It was like taking a bath near the surface – but boy, did I feel those thermoclines as we descended. Still, no time to think about that now. 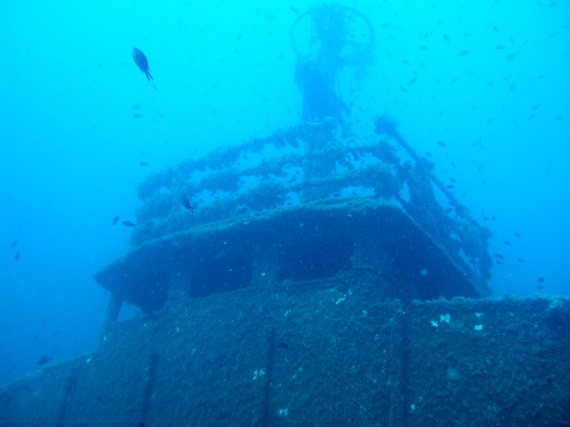 This was the wreck of a small cargo vessel that sank in the 1980s – but it’s not clear why. No sign of any damage anywhere, no collapsed hull plating, nothing. We dropped past the mast, down to the bridge level, then to deck level and then even further into the open hold. 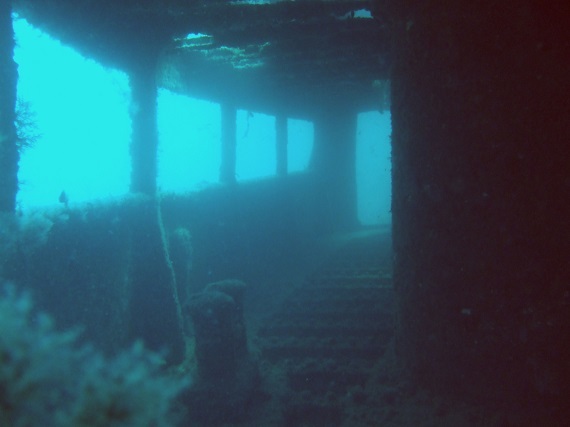 The route then processed us through, up and over the bow, and then down towards the seabed, before turning back towards the stern. 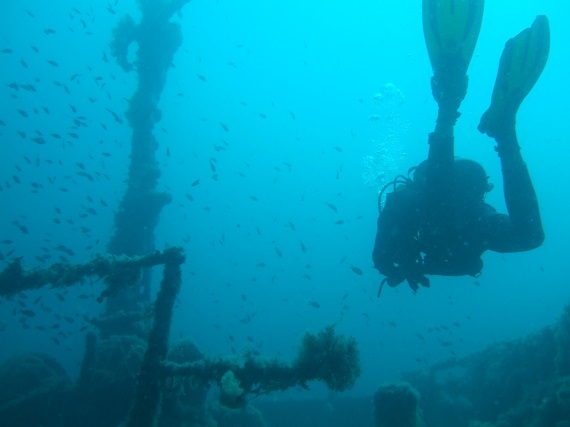 On the second half of the dive Theresa guided us into the superstructure and along a corridor, where the deck appeared to have either collapsed or rotted away. Some of the rooms looked clutter-free, but we resisted the urge to enter. After 40 minutes we signalled for the surface, and an upwelling warm current was the welcome reward to ride out the safety stop. Second dive of the day after a brief surface interval is a wall dive back along the coast in a marine reserve known as ‘El Toro’. 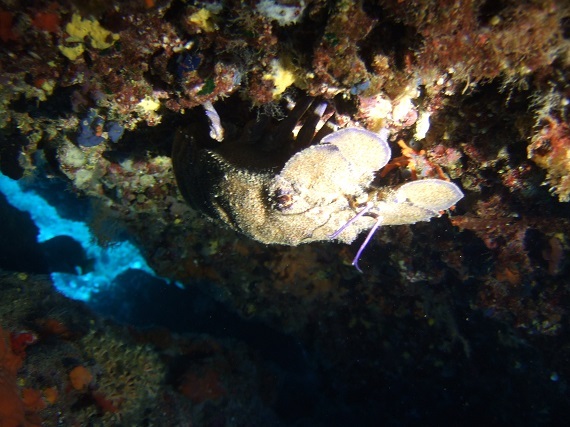 There are some rocky headlands and sheltered bays here, and the target for us is a wall dive. 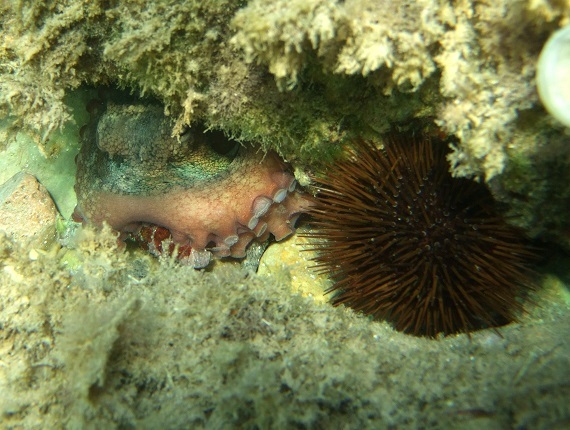 We splashed and descended to about 25 metres, looking into every crevice for octopuses, lobsters, eels and a great many nudibranchs, which appear to have made this place their home. 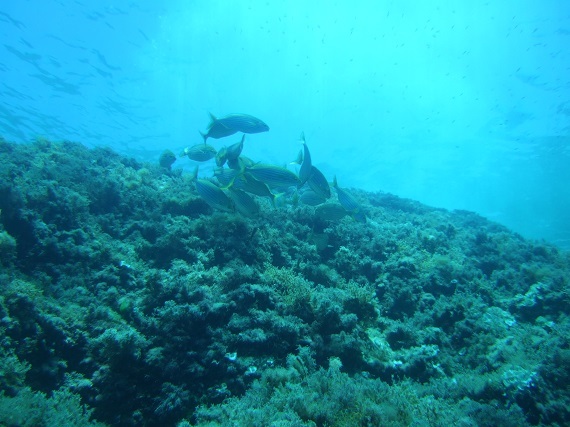 A picturesque and beautiful underwater vista sails past, as we swim first one way and then the other. Mallorca may not be famed as a dive destination, but on the strength of this brief foray it deserves to be. Even the Great White Sharks are keen to check it out.